The latest version of the VMware Workstation virtualization program 15 Pro was released by VMware on September 24, 2018 for download and use. You can install VMware Workstation 15 on both Windows and Linux, and you can create new virtual machines and install different operating systems. Installing VMware on Ubuntu 18.10 is quite simple and easy. In our previous articles, we installed VM Workstation on other Linux/Ubuntu versions. You can find these articles in the links below. In this article, we will install the virtual machine program to run a Windows virtual machine on Linux/Ubuntu. Previously, if you did not install Ubuntu, you can browse our article titled How to Install Ubuntu 18.10 with VMware. To set up and use the virtual machine sofware in Ubuntu, follow these steps in order. To download the VM software for Linux, visit https://www.vmware.com/products/workstation-pro/workstation-pro-evaluation.html. Move the Pro.bundle file to your Ubuntu desktop and then open the Terminal. First, follow the sudo apt-get update command to update the Ubuntu package list. Execute sudo apt-get install gcc build-essential to install the necessary packages to run it on Ubuntu. You can review the Ubuntu dependent packages from the image below. Press Y to continue the installation and then press Enter. After installing dependent packages, switch to the desktop in Terminal. 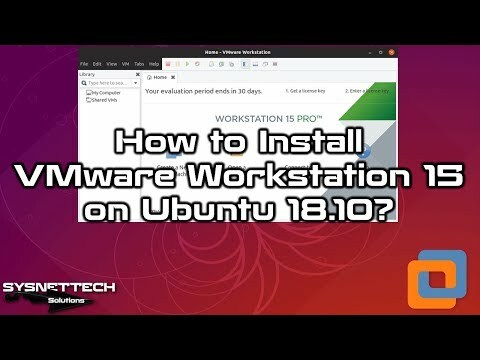 Then follow the commands below to start installing VM Workstation 15 on Ubuntu 18.10. In the installation wizard, accept the license agreement and click Next. If you want to check for updates initially, check the Yes option and click Next. We recommend participating in the customer experience program. Select Yes and click Next. Type in your user name and click Next. You can configure the installation location of virtual machines in this window. If you want to change the default location, click Browse. Otherwise, click Next button to continue the installation. The 443 port is the default port to provide https access to the Workstation Server. You can change the https port in this window. Click Next to continue installing VMware software. If you purchased this program for Linux, enter your license key. If you want to use the virtualization program for 30 days, just click Next. Wait while installing VMware 15. After completing the installation, click Close. Start the program by clicking on the shortcut from the menu. To enable the trial period, enable the VM softare for 30 days option and click OK. Type your root password and click Authenticate. You have successfully installed VMware Workstation 15 Pro! You can watch the video below to setup VMware Workstation 15 in Linux OS step by step, and you can also subscribe to our YouTube channel to support us! In this article, we have installed VMware Workstation 15 Pro to run Windows, Linux or macOS virtual machines on Linux systems. Thanks for following us!